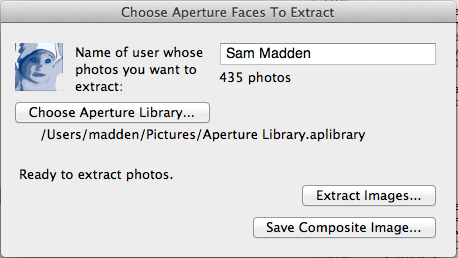 Extract images of faces found by Aperture 3.0 in your photographs. This MacOS application scans your Aperture Library and finds images of faces it has identified in your photographs. Aperture itself provides no way to extract these snapshots, although they can be seen when you click on the "Faces" panel in your library. 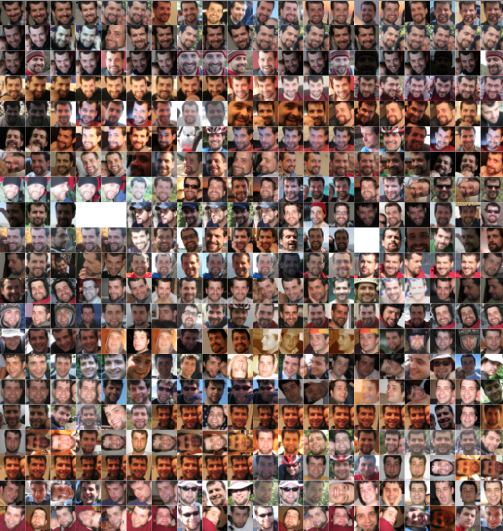 Given an Aperture Library (I've only tested Aperture 3.1.3 but I believe it should work with any Aperture 3.x version), and the name of a person whose face you've tagged, it lets you extract all of the images of that person, or a create a composite PDF with all of the images in a tiled format. Unfortunately, this app will not work with iPhoto library, because iPhoto uses a different format to represent its photo database. With some effort it might be possible to reverse engineer the iPhoto library format as I have done with Aperture. Source code is available as GoogleCode project. Follow instructions on this page to perform an anonymous svn checkout. If you would like to help with development, feel free to submit your patches to me. The Extract Aperture Faces appliation is Copyright 2011 Samuel Madden. It is free for use, and is licensed under the MIT Open Source License. Please email me at madden@csail.mit.edu with questions or comments.